As mentioned on the “who’s behind all this” page, my passion for wine has grown during a season of life where our family has been growing as well. Having 3 kids and them being a priority, the list of wine regions that I’d like to visit has been steadily growing without having been able to cross any off the list yet. That is, until this summer, when we spent a few days in Kelowna. Having lived in Canada for 11 years now, I’d like to see Canadian wines gain greater renown, in Canada itself as well as internationally. Chances of this happening for wines from my original homeland are rather slim (interestingly, The Bacchus recently published an article about this: see Beer-brewing Dutch try their hand at making wine), so I’m putting my money on my adopted homeland to generate some buzz in the world of wine. Growing grapes in the Okanagan doesn’t come cheap. The two main factors here are the costs associated with vineyard land and labour. Especially compared to several other wine regions that have come onto the scene over the past several decades (think Chile and Argentina) both of these components are rather expensive in the Okanagan. As a result, you’ll be hard-pressed to find a good-quality bottling from the Okanagan for around $15, while countries like Chile and Argentina offer these quite abundantly. In my humble opinion, the Okanagan lacks identity. The Argentineans realized that Malbec was their ticket to the world-stage, so they focused their production and marketing on that varietal. This ensured that for the vast majority of consumers Malbec is now uniquely associated with Argentina. New Zealand Sauvignon Blanc, Australian Shiraz, and Californian Cabernet Sauvignon come to mind as well. Clearly, these regions produce wines from other varieties as well, but they figured out which varietal works well for their climate and soils, as well as what consumers would appreciate, and then focused on that varietal to create a clear identity for themselves. Creating a clear identity for the Okanagan is in part a challenge due to the differences in climate across the valley. For example, Kelowna experiences 1200 Celsius degree days (a measure to express heat accumulation for grapes) and 12 inches average annual rainfall, while Osoyoos experiences 1450 Celsius degree days and 8 inches average annual rainfall. These differences in climate result in different varietals and other differences in the wines produ, thereby making it impossible to perceive the Okanagan as a uniform region. Interestingly, the two challenges are related: winemakers in the Okanagan aren’t going to be able to change the expenses associated with growing their grapes and producing their wines. So in order to be able to offset these higher costs, they are going to need to focus on quality by figuring out which grape varieties produce the best results and then focusing their production and marketing on those varieties. This includes letting go of varietals that may be considered “prestigious” but simply don’t work well in large parts of the Okanagan, the prime example being Cabernet Sauvignon. Jane Hatch from Tantalus Vineyards in Kelowna tells the story of how saddened the previous owner was when they pulled up the plot of Cabernet Sauvignon vines after Tantalus had purchased the vineyard and winery. Her question in response was if he remembered how often the Cabernet Sauvignon grapes properly ripened. The answer: about twice every 10 years. So instead, Tantalus decided to focus on Riesling and Pinot Noir, which ripen properly and create beautiful wines in this more Northern part of the Okanagan. So which varieties to focus on then? Personally, I would love to see the Okanagan become a champion for Pinot Gris. First and foremost, this grape variety is very well suited to the soils and climate of large parts of the Okanagan. The Alsace, which is one of Europe’s wine regions that’s well-known for high-quality Pinot Gris bottlings, shows several similarities with the Okanagan: lots of sunlight, very little rain, and rather cool (as far as wine growing regions go). There are lots of differences between the two regions as well, but considering the similarities, it’s no surprise that Pinot Gris does so well in both regions. Additionally, Pinot Gris often produces rich wines that feature tropical fruit, apricot, and honey, balanced with green apple and lemon flavours. They are generally slightly off-dry. I believe this style suits consumer tastes in Canada and the US in particular very well. The downside is that Pinot Gris is a relatively unfamiliar grape variety, so does not have the same credibility as the Chardonnays or the Sauvignon Blancs of this world. However, this provides an opportunity as well: no wine region outside of Europe has decided to make Pinot Gris “their own” yet, so this creates a void that the Okanagan could fill and quite successfully so. How many had heard about Argentinean Malbec 10 years ago? It can be done! In addition to recognizing the grape varieties that are best suited to the Okanagan’s climate and soils, it will be important to recognize the differences between its sub-regions. 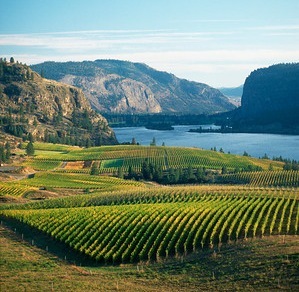 Ideally, we would see an official recognition of the Okanagan’s five sub-regions (Kelowna, Naramata, Okanagan Falls, Golden Mile, and Black Sage/Osoyoos), which would allow for those sub-regions to be more prominently displayed on wine labels (instead of the “Okanagan Valley” designation). If that’s too ambitious for now, a differentiation between north and south would be a step in the right direction. Officially recognizing the differences between each sub-region would then allow for each sub-region to capitalize on their unique strengths. This would result in a clear identity for each sub-region, thereby enabling consumers to more easily find the style of wine they prefer. This would also allow each sub-region to focus on the varieties that suit each sub-region best. But that’s a whole other discussion, which we’ll save for another time! Harry has been saying this for as long as I have known him! He said that you have perfectly put into words that he has said for years! Well done Matthijs! This blog needs to be circulated in the Okanagan!